CO2 application is the most finicky and ethereal component of all the things associated with a planted tank. In a high tech tank, it is arguably the most critical item and is the cause for more headaches than any other issue. This is because unlike solid powders or liquid drops, which typically are well behaved, we are dissolving a gas which in a way is like herding cats. Like the other nutrients, if the level is too low the plants suffer and algae is induced. Unlike the other nutrients, high levels cause immediate toxic effects to critters through asphyxiation. Why is it so difficult to maintain proper levels? What does a drop checker tell us? The drop checker is nothing more than a pH test kit, despite the grand claims on the packaging such as "Long Term CO2 Indicator". 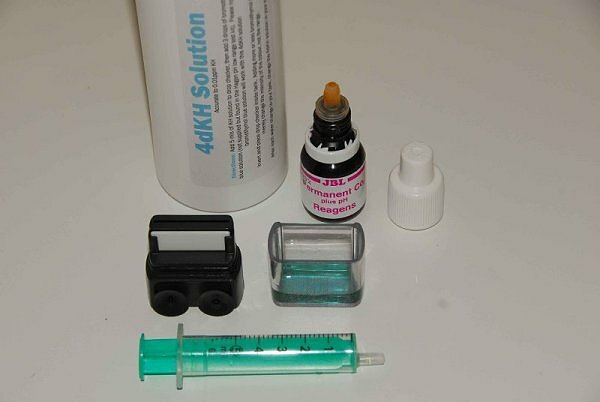 Many hobbyists already own a pH test kit which typically, shows blue if the water sample is alkaline (> pH7), green if neutral (=pH7) and yellow if acidic (>pH7). These s are typical when the reagent in the pH test kit is Bromothymol Blue. What we are hoping is for the checker to show us the pH at which we have carbonated the tank water high enough to satisfy the plants' demand but low enough to be non-toxic to fauna . Most agree that the nominal concentration level for highly lit tanks (> 2 WPG) is at or around 30 ppm. When CO2 dissolves in water a small portion of it combines with the water to form Carbonic Acid. As more CO2 dissolves and combines with water, the more the pH will drop. pH is an upside-down measurement A pH rise from 6 to 7 indicates a tenfold decrease in the acid concentration. A pH drop from 6 to 5 indicates a tenfold increase in the acid concentration. kH is referred to as "carbonate hardness" and is a measure of the amount of carbonate and bicarbonate in the water. These are coincidentally the same type of products which occur as the Carbonic acid are formed by CO2 injection. If, however, the water already contains carbonates and bicarbonates, the effect is to neutralize the acid. Carbonate and bicarbonate therefore act as "buffers", to keep the pH higher even as more CO2 dissolves in the water. It is for this reason kH is also known as a measure of the "alkalinity" of water (alkalinity=high pH). Conversely, Hobbyist "B" has tap water also measuring 7.2 but kH 6. More acid can form in his water (because of less carbonate and bicarbonate levels), so 30 ppm dissolved CO2 in his water will result in a pH drop to 6.8. If hobbyist "B" suddenly added sodium bicarbonate to his water, his kH would rise. No CO2 would be lost. He would still have 30 ppm CO2 dissolved but the bicarbonate would bond to more acid in the water and he would immediately see a pH rise. This property of carbonate/bicarbonate is exactly why sodium bicarbonate is used to neutralize stomach acids when we overeat. If dissolved CO2 were the only source of acidity in the tank it would be a simple matter to measure the pH and use the equation/chart to determine CO2 levels. Unfortunately this is almost never the case. There are many acid and alkaline sources in the tank varying from urine and ammonia to phosphates we ourselves add as nutrients. The pH measured in the tank is therefore unreliable because it does not accurately reflect the acid caused by CO2 dissolving in water alone. The accepted practice is to fill the drop checker with distilled /deionized/RO water that has been adjusted to a known kH value. 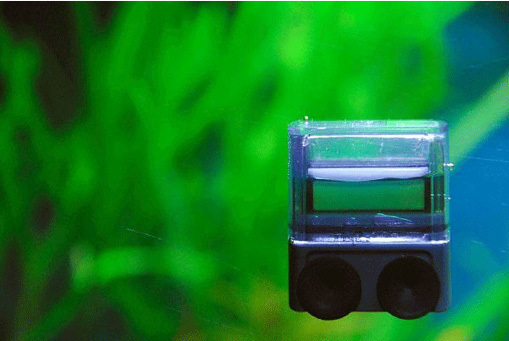 In this way the drop checker water is isolated from the tank water and only reacts to direct contact with CO2 evaporating from the tank into the checkers air bubble and then into the water sample. It was reasoned that a distilled water sample adjusted to a carbonate hardness of 4 dkH a 30 ppm concentration results in a pH of approx 6.6 which, using the reagent of a pH test kit in the drop checker turns the water sample in the checker green. 4dkH water has now become the standard solution for drop checkers, however 5 dkH can be used as well. With a 5 dkH a green (6.6 pH) will indicate 38 ppm. These solutions can be made but AE also sell it. How is the checker assembled and mounted - Are all drop checkers equal? This shows the JBL drop checker kit consisting of a black base, a transparent vessel for viewing and a bromo-blue reagent (which isn't actually blue). In the back is a bottle of 4dkH water purchased from AE and in the foreground I have a cheap plastic syringe with ml markings. I (ahem) liberated the oppressed syringe from my GP. NOTE: The reagent and water volumes given below are unique to the JBL kit. Other kits will list quantities for their own particular ingredients. 1.Using the syringe I pull 1.5 ml of the 4dkH from the bottle and transfer to the clear plastic vessel. 2. Squeeze 3 drops of the reagent into the vessel and shake gently. The solution will turn a blue-green indicating a pH of around 7. 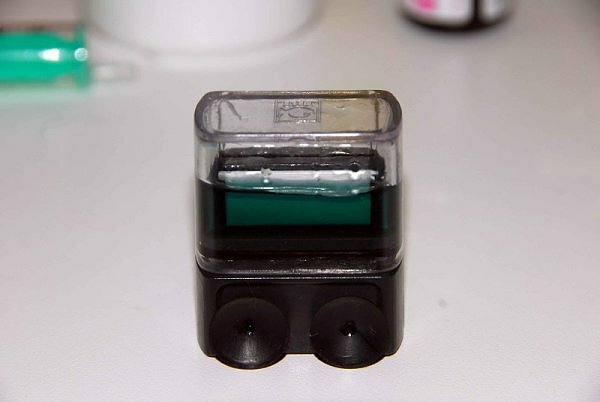 If you notice in the photo, the black base has a white plastic band against which the colour of the reagent can more easily be seen. As cheesy as it appears, this is a brilliant feature. When the checker is in the tank it's difficult to distinguish reagent colours against tank background and plant colours. 3. Invert the black base so that the white plastic end is inserted into the plastic vessel and snug up the assembly. A bit of silicon grease around the o-ring will make it easier to separate later. 5. Next, holding it level, mount the checker anywhere on the front glass inside the tank so that air is trapped in the vessel. Should I turn off the gas at night? Turning off the gas is optional and many prefer this method because it can really stretch your CO2 supply out by up to double. CO2 isn't needed at night as the plants use oxygen and so compete with the critters. If the gas is turned off it gives them a break and the peak level can be driven higher during the photoperiod. The penalty of this method of course is an added layer of complexity. You'll need a solenoid and timer. Silly things can go wrong and wreck all your efforts - kinked hoses, electrical faults, leaks, you name it. CO2 faults are unforgiving. Despite all that I feel the benefits of ON/OFF outweigh the disadvantages. Drop checkers' colour change response is slow for many legitimate reasons. In the morning, after you've turned on the gas, the checker colour is only telling you what the CO2 concentration was an hour or two ago. At some point during the day, the CO2 concentration in the tank arrives at, and stabilizes at it's maximum (injection rate minus evaporation and plant consumption). An hour or so after that, there is an equilibrium of CO2 concentration in the tank, in the bubble and in the checker's water sample. This process may take 4 or 5 hours so you have to be patient with the drop checker and with the adjustment of your bubble rate. If you lose your nerve too early because the colour isn't changing fast enough you turn up the gas and a few hours later the fish suffer and the checker turns bright yellow. You see the fish suffer and turn down the gas then the plants may suffer. This is the yo-yo effect many suffer and can often induce algae. You need to use the drop checker systematically and with patience. Give yourself some time like on a weekend when you are home to observe. Use 4 dkH water. Set your initial bubble rate and observe the colour changes throughout the day. Find the maximum stable concentration and note the time of day it occurred. If that colour is too blue make a minor adjustment by increasing the bubble rate and leave it there for another day. Note the maximum again and make another minor adjustment if necessary. Remember that most fish can tolerate a limeade green or even into the yellow if you turn off the gas. You will find that with a covered tank you can turn the gas off 2 or 3 hours before lights off. In the morning the checker may still show in the green. No problem, turn on the gas an hour or two before lights on. If you are patient and methodical, you'll find that you'll consume a lot less gas because your timing will be right. It's much more important that your concentration is up to nominal level in the morning when lights first go on. In the afternoon the concentration has maxed out and the plants are on cruise control. Nearing the end of the day you can throttle back but there is still plenty of gas dissolved and the plants are beginning to lower their consumption. Remember to not get tunnel vision and become hypnotized by bubbles in the counter - the values shown are just a guide and are provided simply for orientation. When should the reagent be replaced? The standard practice is to clean the vessel and to replace the drop checker fluids whenever a water change is performed, typically once a week. If we could visually detect CO2 in a tank we would see that the distribution is uneven. The plant in the upstream area of the flow has greater access than the plant directly behind it downstream. Flow and distribution are not discuss nearly enough but they are as critical as bubble rate and peak concentration. 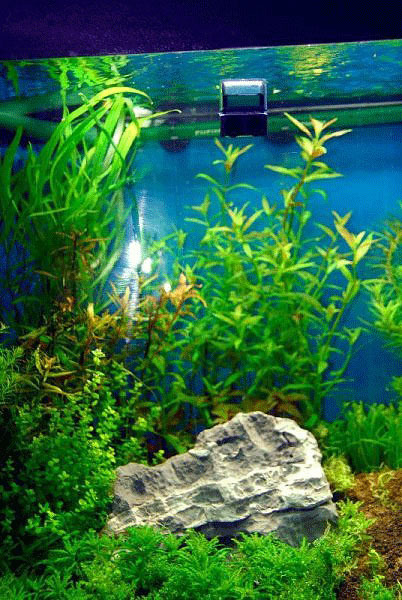 It is often stated that a planted tank should be filtered at a turnover rate of between 3 to 5 times the tank volume per hour. The problem is that no filter ever delivers it's rated flow at typical configurations once loaded with media. Canister filters and sump pumps have to fight gravity as well. Add a CO2 diffuser/reactor and one would be fortunate to get 50% of rated flow. I measured one of my filters which is rated at 1700 L/hour and discovered that the output was 800 L/hour. That was when it was brand new. In my opinion, when deciding on filtration for a tank aim for 3X tank volume, assume 50% loss and choose the model based on these revised numbers. I reckon a 200 L tank should be filtered at 600 L/hour, but that means a filter (or filters combined) rated at 1200 L/Hour. If that seems over the top then consider an alternative by adding a powerhead to deliver flow to the plants. Spraybars versus Lilly Pipes - I've tended to drift away from the lilly pipes towards the spraybars because I observe that the pipes deliver flow towards the central long axis of the tank. This is OK for smaller tanks but as the tank size increases voids and low flow areas form at the sides and in corners, limiting CO2 delivery to those areas. Flow towards the center stalls rapidly as the distance from the outlet increases. Plants in these void areas sometimes have the appearance of suffering insufficient light but actually can be suffering from insufficient CO2 delivery. In long, large tanks consider using multiple spraybars mounted along the aft glass which deliver flow to the front glass which then deflects it down and rearward. This gives a nice circular pattern (somewhat like a vortex) which maximizes coverage. A good indication of proper distribution is when most or all individual plants "sway in the breeze". If the injection rate is optimized, the flow rate maximized and the distribution spread evenly CO2 at proper levels will be delivered to each plant and will minimize deficiency and appearance of algae.